Although I skimmed through your article quickly I can feel what you say Being involved with ISKCOn since 1969 and being initiated in 1978 by one of ‘ISKCON family priests, I do not feel enlivened in the society. I have great faith in KC ‘spiritual science’ but not in the religion that ISKCON has become. I admittedly don’t know what to do as I feel powerless other than to chant my rounds and pray that a way will open up to me. I lived very happily in the temple for over a decade, but have lived independently since 1987 and just don’t trust where it is all going, to be counted as a member. In fact, I find it not very attractive which doesn’t make sense as Krishna is all attractive. I saw you article in the Sampradaya Sun and also the response to it. I have a question for you. As we know either you are part of the problem or you are part of the solution. As a senior leader and sannyasa minister of ISKCON what exactly are you doing to solve the problem, besides writing something that we all know at least for the last 15 or 20 years? As the sannyasa minister what are you doing to stop Hridayananda Das from making a joke of the sannyasa asrama and the rol of a diksa guru. I am sure you are totally aware of his activities, opinions, and life style. And this is nothing new, it is going on for many years Maharaja. Why you are not sanctioning or doing anything to stop such a shameless person who is misrepresenting your spiritual master? Please accept my greetings and the blessings of Lord Krishna. All glories to Srila Prabhupada! Somehow the GBC Body’s attempt to encourage Hridayananda Maharaja to improve his sadhana bhakti and his behavior as a sannyasi have not had the required effect. There is an attempt at another strategy to handle the problem. We’ll have to see what Lord Krishna desires. Thank you for your letter. Actually, I am simply aspiring to come to the platform of sincerely serving Srila Prabhupada. So far I have little or no understanding what it means to be a “rasika Vaisnava”, I am simply aspiring to one day become a servant of Srila Prabhupada’s servants. Our inspiration in devotional service is the instructions coming from Srila Prabhupada. We are all servants of Lord Krishna working in disciplic succession to revive our eternal relationship with the Supreme Lord and His servants. There are undoubtedly some problems in Srila Prabhupada’s movement, so we should try to become more Krishna conscious. If we become better instruments for Srila Prabhupada and Lord Sri Krishna can help us correct some of the problems and create the ISKCON that Srila Prabhupada desired. The gifts that Srila Prabhupada has given us are eternal and invaluable. We should not become disturbed that there are faults in ISKCON, but do the best we can to cooperate with other sincere followers of Srila Prabhupada and try the best we can to give Lord Krishna to others. FATHER AND MOTHER. YOUR SERVANT. 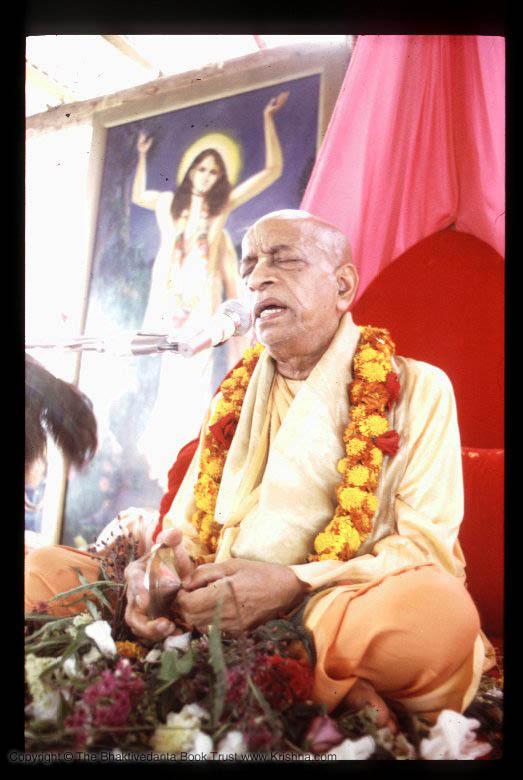 DASANUDASA SACHIDANANDA. SRI KRISHNA BHAKTIVEDANTA GITA SCHOOL ALL OVER THE WORLD.